Is Batman Vs Superman adding Denzel Washington as another superhero? 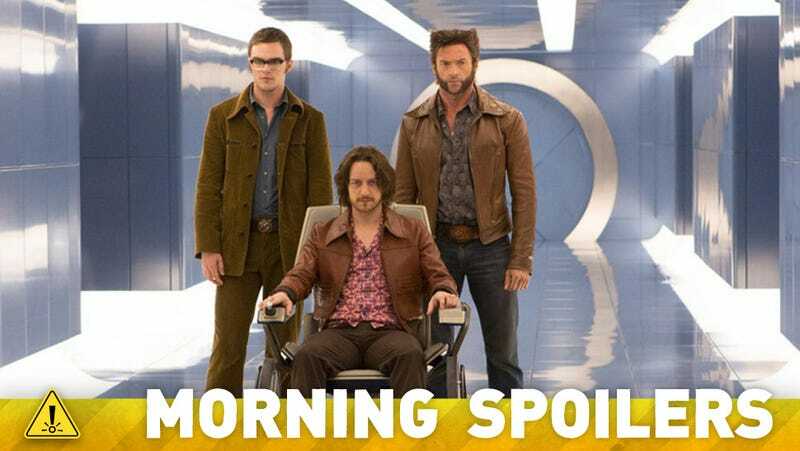 There are new behind-the-scenes photos from Days of Future Past and Rise of the Planet of the Apes. True Blood is recasting a character following an actor leaving due to "creative direction." Steven Moffat promises a "new direction" for Doctor Who. Plus, a new look at Star Wars: Rebels' villain. Spoilers now! He initially joined the show because he wanted to work with [his Forever co-star] Deborah Ann Woll. But when he started reading the scripts for Season 7, he was disappointed to learn that they were going in a completely different direction with James. It changes all the time, and it's keeping ahead of the audience in a way. All shows age and they all age sort of in the same way. You learn how to do it, you get really slick at it, and then you think you're really, really slick at it and everyone's started to yawn. And you think 'oh God, we're really slick at this but everyone knows what we're going to do'. So now we've got to actually get a bit raw at it and do it in a different direction. It happens on every show – you get good at it and 'good at it' is the enemy in the end. The decision for Peter Capaldi to have a Scottish accent as the Doctor was a creative decision and it was not part of his contract. But Peter is best at acting in a Scottish accent and he was delighted when he found out he could play the part with his own voice. It gives his character a stronger identity as well. We actually see it as a slow burn, so this season is really going to be focused on the characters that we've set up and what parts they play in what's beginning to unravel. As the series progresses, we'll absolutely be opening everybody's minds up to what's really going on there. We have to be very careful about how we do that because part of the fun of the show is that you are with the secret few who know what's really happening and the rest of the world doesn't. We don't want to let that vibe go. TAKING BACK POWER — As the French Quarter prepares for its annual celebration of the Casket Girls Festival, Cami (Leah Pipes) suffers through as Davina (Danielle Campbell) attempts to free her of Klaus' (Joseph Morgan) mind compulsion. Elijah (Daniel Gillies) and Marcel (Charles Michael Davis) form an unlikely alliance as Klaus sets his plan in motion to get Davina back. Once it's known that Davina is missing, Sophie (Daniella Pineda) gets in on the hunt to track her down. Meanwhile, Hayley (Phoebe Tonkin) is forced to make a tough decision after receiving an unexpected phone call, and Rebekah (Claire Holt) sets her own plan in motion when she enlists the help of someone from Marcel's past. Jesse Warn directed the episode written by Charlie Charbonneau and Michelle Paradise (#110). Bo narrowly escapes a vengeful Fae's attack; a visit surprises Kenzi; Bo questions feelings for someone she loves. Elena, bitten and turned into a werewolf, flees to Toronto, but is pulled back to upstate New York when an all-out war between rogue mutts and her Pack family begins. At Stonehaven, Elena tracks the killer Mutt while avoiding the advances of Clay Danvers; haunted by her own past as a killer, Elena is desperate to get back to her human life. Old chemistry resurfaces as Elena and Clay work together; Elena threatens the Mutt leading to the change as they fight him in his wolf form.